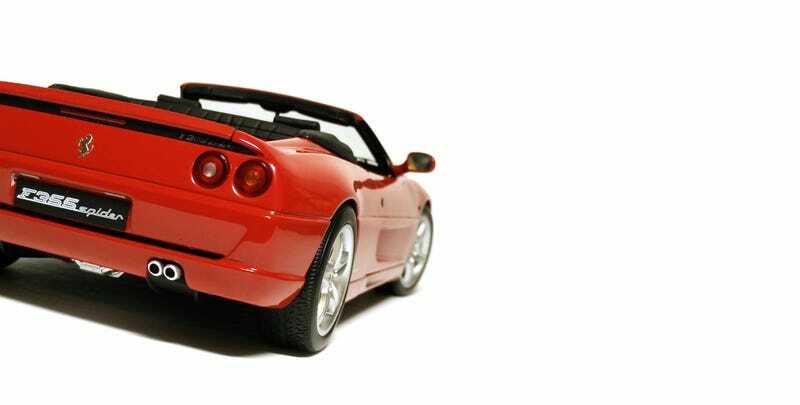 The Ferrari F355 Spider, by Hot Wheels Elite. Design-wise, one of the best-looking Ferrari’s ever. But owning one? No thanks. Unless it’s in 1/18 scale of course. Obviously, I would rather have the coupe form of this car, but those are a little above what I would be willing to pay for a car that I don’t absolutely need in my collection. In convertible form, it loses its sportiness and, dare I say, looks a bit bland. It makes you realize how basic the overall shape of the 355 is. Certainly doesn’t help that my phone has trouble picking up the deep Rosso Corsa of this ‘rrari. The rear end remains the best feature of this car, with the double-circular taillights that made past Ferrari’s so pretty to look at when they pass you. The front, meanwhile, is a dead giveaway of this car’s age. Headlights pop up though, and they actually work here! Just push that unsightly little button under the front bumper. This model, again, is brought to you by Replicarz. Once again, a spur-of-the-moment purchase just because they were dirt cheap. How much? More than you can afford, pal. They had them on clearance for $30, which is about what you would pay for one of the “regular” 1/18 Hot Wheels. I believe they call those “Heritage” models. But this is the Elite version, which has added details to justify the price hike. I don’t have the regular model (nor a UT) for comparison, but it’s pretty obvious that the details here are about what you would see on other high-end models. It’s not perfect though. The solid front grille still looks kind of cheap. There are some fit and finish issues. The pop-up headlights aren’t perfectly in sync. There are stray glue marks throughout the car. Most of all, I don’t like that the rear wheels stick further out than the side panels. I’ve seen better from Hot Wheels, but this is a well-detailed model for budget prices. Let me know if you need one - I have an extra.